In the far back corner of my property sits my little garden cottage, of which I am quite enamored. It's not quite a she-shed, as it's a hard working and very valuable piece of real estate. Not to mention it's usually a bit of a mess inside, as I am an avid gardener and it gets used regularly. But that doesn't mean it shouldn't look good while working hard, right? This photo was taken the first summer, after a significant amount of work had already been done to make her structurally sound and somewhat level. 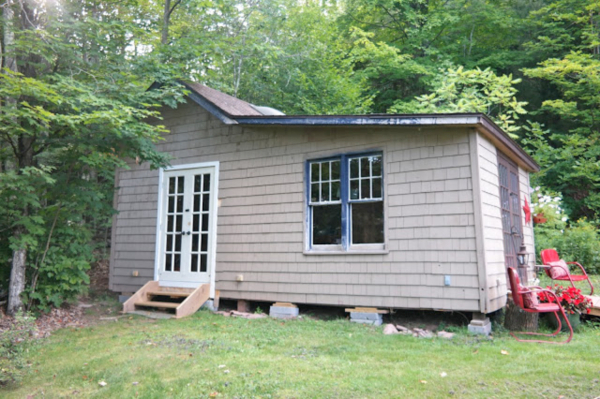 Not the prettiest little garden cottage in the world, but she had come a long way for sure. After a fresh coat of paint she was looking much happier, no doubt. But I knew she had much more potential! 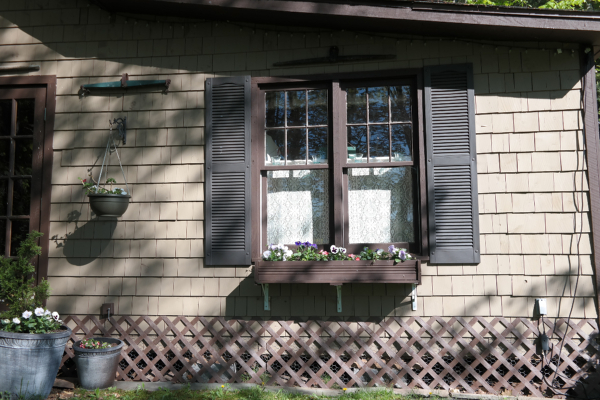 The addition of a pair of shutters and a window box made a big improvement, as well as some potted plants to dress up the exterior. But I still knew she had more in her. Yesterday I came home from work to find Sweetie in a sweaty heap, as he had been working on my garden cottage for a few hours while I was at work. He's such a good sweetie, he really tries to do all he can to help me with stuff around my house. I am such a lucky woman! Do you see what Sweetie was working on? Can you spot the improvement? He installed the lattice around the base to hide the chicken wire and cinderblocks!!! That was the next step that needed to be taken before I could move forward with the next stage of operation-she-shed! What a wonderful improvement the lattice is! I had purchased it last year when I was having some other lumber delivered to the house, so they could deliver it all at once. And then it sat in the other shed for a year, waiting to be cut and installed around the base of the garden cottage. I was originally going to tackle it myself but I knew in my heart of hearts that Sweetie would do a much better job than I would. I was right! Sweetie is a perfectionist, and he does a much better job than me on things that require precise measurements, no doubt! Now that the lattice is installed, I can move forward with the next step....planting a little garden around the cottage. Nothing crazy, just a few plantings to dress up the outside. The first thing to be planted is something I have wanted for quite some time - a tree form Hydrangea. Mom and Dad gave me a gift card for my birthday with specific instructions that I was to purchase exactly this, as I had admired the one outside their house for years! This is the one I selected, and I placed the order today. It's called Pinky Winky Hydrangea Tree (I know, awful name!) and I ordered it from The Planting Tree - their price was less than half what my local nursery was charging, and shipping was free! It's already shipped, and I can't wait to get it planted! 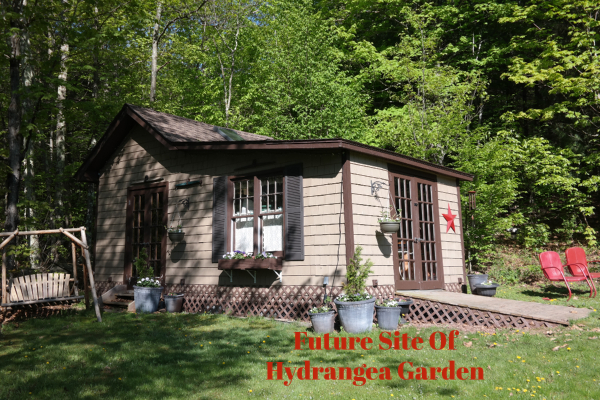 The Hydrangea will be planted at the corner of the shed, and a curved garden bed created around it. I will use the remaining paver stones to make the edging, and add some mulch to finish it off nicely. It's an absolute nightmare digging a hole around here, as we are on a mountain top. Clay soil and tons of giant stones, ugghhh. I dread that part of it, but can't wait to make more progress on my she shed dreams. A couple of years ago I put in a 'wild' garden to the left of the cedar swing. It's coming along nicely, still rather wild as it always will be, but I'm starting to get some blooms as well. 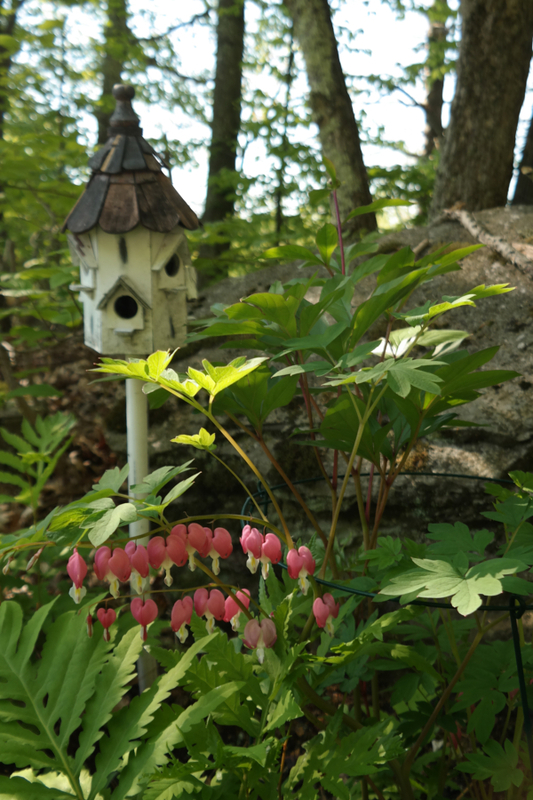 Right now the Bleeding Hearts are in bloom - aren't they just lovely? They are one of the most interesting flower forms out there, no doubt! I had originally planted three Bleeding Hearts, but one didn't make it. I tried to replace it last year with the same variety, but they were sold out! Fortunately this spring they had them in stock, so I've planted number 3 again....perhaps I'll see blooms on it next spring. I also planted 7 peonies across the back of the wild garden, and most of them have buds on them this year - yippee, this is the first season I'll get any flowers on them and I absolutely adore peonies!!! Every year I transplant pieces of this and that into the wild garden. Some day it will be awesome, at least I think so.....right now it's still young, and still very much a work in progress. To the right of the red chairs outside the garden cottage is this beautiful Lilac, which was a housewarming gift from Mom and Dad. I think it's appropriate that the tree Hydrangea also graces the garden cottage, keeping company with the Lilac. The Lilac is such a vibrant color, I absolutely adore it. I use a lot of red in all my other gardens, but for the garden cottage I keep things much more tranquil, using pinks, whites, and blues. If anyone has any suggestions for other plantings to go in the new Hydrangea garden, I'd love to hear them! I want it to be much more refined than the wild garden, not too formal but definitely much more controlled than some of my other garden beds. I have dreamed since the day I first toured this property of making what was once quite the eyesore into a true showpiece. She's come a long way in the three years since I first bought my house, that's for sure! Wishing all of my lovely readers a wonderful Memorial Day Weekend! If you need me, I'll be in my garden cottage! What a transformation! It looks fabulous, you were doing such a great job. What a wonderful little getaway, and in such a beautiful setting. 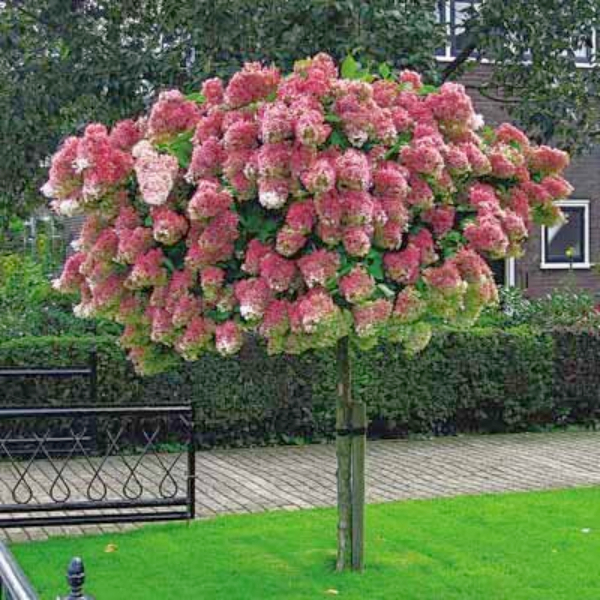 I have never heard of a tree form of hydrangea before, but I am very interested in finding one of these. I’m afraid I may have overdone it in the plant buying department, and now I’m awaiting the delivery of, brace yourself, eight more pots. Eek! Oh Pattie, your deck is going to be fabulous with such a big container garden!!! I can't wait to see photos when you get it all set up! Your shed looks so pretty and you have a great Sweetie to surprise you with the new things he added. He is a keeper. I love lilacs too, but ours did not flower this year do to the long winter we had. Oh that's a shame, Betty! We had a long winter as well, and I was concerned, but they did manage to flower! I don't think some of my established lilacs had quite the bloom they had last spring, but at least there are some flowers to cut and bring in the house! Your place looks lovely,have a happy memorial day weekend! That's a brilliant idea, Pat! I had one in my previous house and it did help when I was planting a Weeping Cherry...wow, I miss that tree!! I keep trying to figure out a spot to plant one at this house....along with a Redbud...but I don't want just a pile of random trees all over the place either, which would make it so much harder to mow! Can't have it both ways, right? Ha ha I'd be tempted to also....too bad you don't know the homeowners, perhaps they'd let you take a piece! Of I guess if all else fails you can order one! Mine was a lovely gift from my parents - I still have the tag on it - if you need the name of it let me know! Your shed is looking great with the lattice. My hubby and I just installed lattice around the bottom of my back deck and it was a job! Thankfully my hubby is good with measurements and I am good with a hammer, lol. Love the color of your lilac. I think if I was doing the measuring it wouldn't have been nearly as nice, Penny - I don't have the same patience he does for these things, to be quite honest! I think he loves for me to come home from work to a surprise....but I surprised him that day as I came home early while he was finishing up! You're so lucky you have that!!! I love it!!! I know I really am lucky, Ellen - even though it was quite dilapidated when I bought the house, I knew it had great potential and it was a definite plus!! 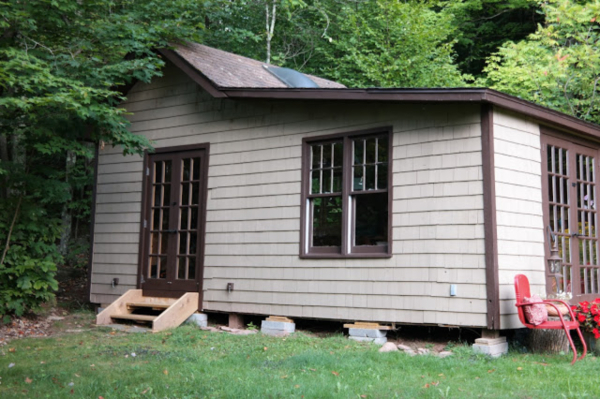 The cottage progress over the years was fun to see. Love that hydrangea tree...first I've seen one of those. All of your blooms are lovely especially that lilac / mine is a pale purple ; I really like the vibrant color of yours! I have pale purple as well as white lilacs as well, Deb - they came with the house. I planted some lilacs along the fence line but sadly no blooms yet, which is sad...I really thought this was going to be the year as they are in their 4th season! I have never heard of a hydrangea tree before, but the picture shows that it is just lovely. We have plans to plant a lilac tree just outside our bedroom windows next year when we finish building our home. I just love the smell of lilac! Your shed is becoming more beautiful with every project, I can't wait to see it with your new hydrangea tree! Have a wonderful weekend...cheers! I think I had planted a hydrangea tree in my marital home also, Vickie, but it wasn't this variety...probably a Home Depot special that I bought half dead or something, ha ha!! 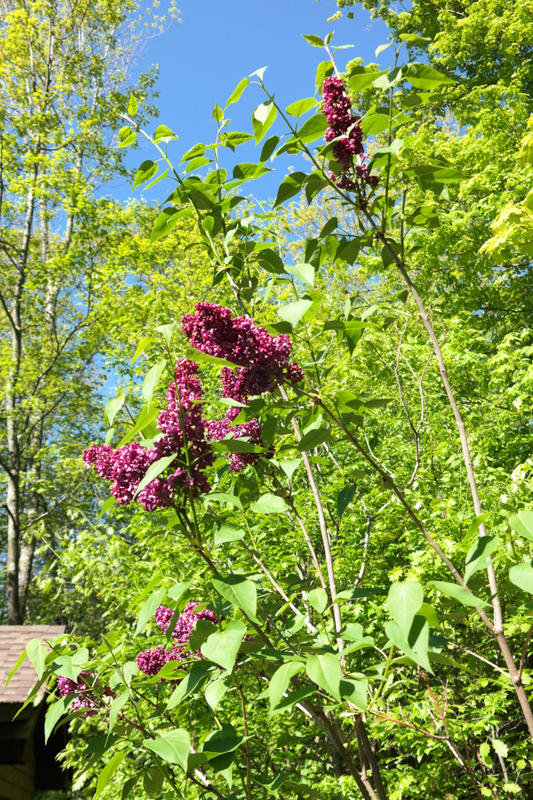 I planted 4 new lilacs the first year I was in the house, and there were some established ones around the perimeter as well, so some day the scent of lilacs should be enveloping the house and wafting through every window! Happy Holiday Weekend to you as well!! You inherited quite a lovely little garden cottage when you bought your mountain top home! You're a lucky lady and your sweetie sounds delightful. He is a wonderful generous sweet handsome man and really tries to do things to make me happy, Brenda - the best kind of man!!! It all looks wonderful and the pink hydrangea tree will look so pretty with the brown cottage shed. A little at a time....we have been here 22 years and every year I find something new to tackle. And once you're done you need to start all over again, right AnnMarie!!! My deck needs painting again, sigh, these harsh winters really take a toll on it....someday it will be rebuilt with Trex or similar but for now that is absolutely not in the budget! Those trees will be lovely, and the gardens too. Oh I love the idea of a wild garden!!!!!! Yesssss!!!! I had a wild garden at my previous house, and I loved it! I didn't worry much about weeding it, it was where I put things I wanted to spread like crazy! This one is a little more tame, but not much as it's full of native ferns in addition to everything I've stuck in there! You could put a for rent ad online with pictures of that garden cottage and have a lot of people ready to move in. It is so darn cute! And the tree hydrangea, whoa, what a charmer that will be there. And I'm not going to even talk about your lilacs, you who live on a mountain in the cold north, while temperate Nashville saw early buds on lilacs only to have them burnt to a crisp one night. Not funny, Mother Nature. 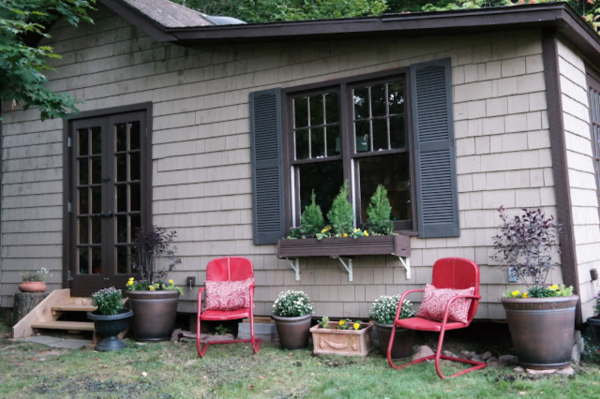 Wow, great transformation to your sweet garden cottage. Glad Sweetie is helping you get it just the way you want it. Thanks for stopping by so I could visit your blog. I'm going to check your other posts on the cottage. Take care. Thanks, Judy! It's in the fourth season of improvements but every year she seems to get a little more like the vision I have in my mind! 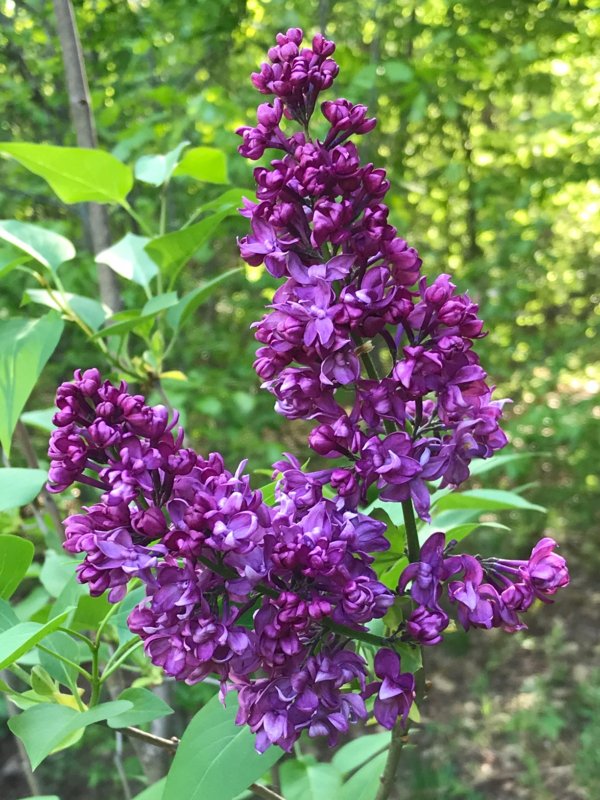 I have a couple of other lilacs on the property that were here when I moved in, but that one is special to me as it was a gift from my parents the very first time they came to the house. The lattice finishes off your little garden shed nicely. Your Sweetie did a great job, and you are blessed to have him. Your hydrangea tree is going to be beautiful as will the little garden around it. I love your lilac, they don't like the tropical climate where I am, so I grow a 'tropical lilac'. It has buds that I'm waiting to see open up to get photos of. Wow, I never heard of a tropical lilac, but no doubt you have many things growing at your place that would never show up in any gardens here, Lorraine! Me, too, Lorraine! They definitely have one of the coolest flower shapes! 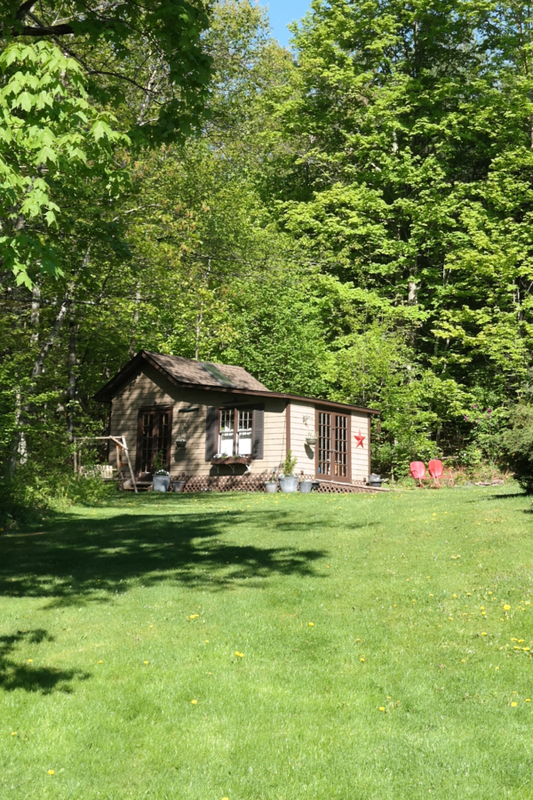 Love your cottage-shed...wish I had one! I have nowhere to keep my gardening stuff except the garage - which is fine, I suppose, but I really dislike planting on my front porch. I've never seen a hydrangea tree. Have a great holiday weekend! I admit it was most definitely something I was super excited about when I bought the house, Melanie! I envisioned the most perfect potting shed like I see on Pinterest....however the reality of the interior is quite different....at least for today! Wow, what a wonderful she-shed now! I meant to get a bleeding heart this year, but haven't found one yet. I couldn't do any planting until now, so I need to look around a bit more. I ordered mine online, at Easy To Grow Bulbs, Carole. Less expensive than the garden centers and a heck of a lot smaller hole to dig, which is always a huge plus for me! Hi Debbie, I thoroughly enjoyed my visit! I can see you are an avid gardener. We have much in common with our gardens. Mine will always be a work in progress. I am still dreaming of a potting shed. Your lilacs are just gorgeous. I am too far south to grow them! I hope you will join me for my Gardens Galore Link Party on June 4. Happy Memorial Day Weekend! Thanks, Pam! Yes I am definitely an avid gardener, unfortunately my full time job does get in the way of my garden time, ha ha. Well, without it I wouldn't be able to pay for my house and all my garden goodies!! 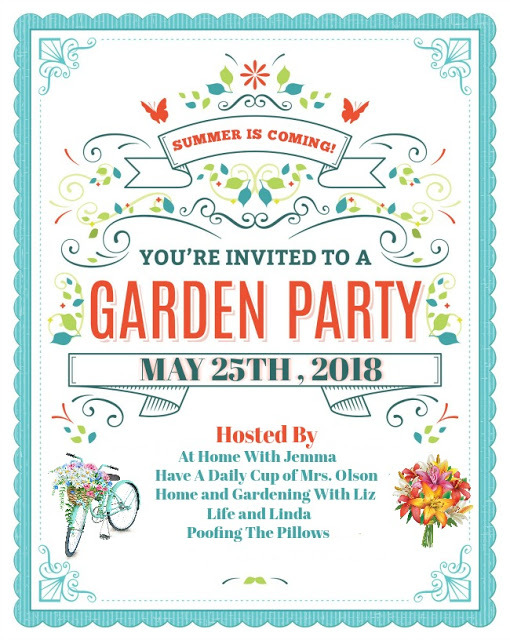 I'll mark my calendar for your garden party! Just beautiful! I noticed the lattice trim right away, and that Pinky Winky is actually something I've been thinking about getting too. There's so much work to be done right now, I don't even have the energy to blog about any of it. I try to catch up with reading my friends' posts, and that's about as good as it gets, and that's good enough! 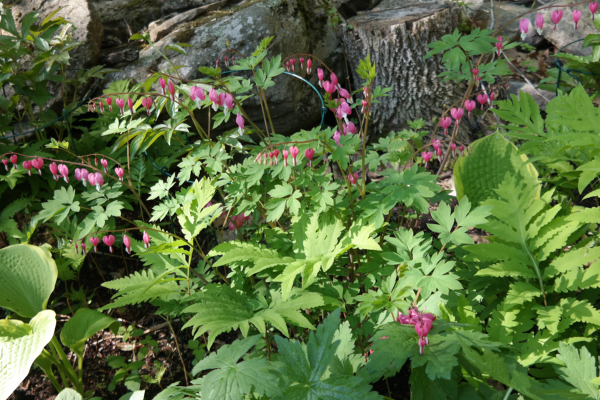 The bleeding hearts are wonderful plants. I gave one of those to a friend when her dog passed away - a good memory plant with its form. I hope your weekend has some rest & relaxation built in, not all work! Have a good one! Rita, I would highly recommend the company I bought my tree hydrangea from - the link is in the post. The tree arrived in two days with free shipping and in perfect form, with tons of flower buds already on it! I couldn't be happier with them - it was the first time I ordered from them but won't be the last! 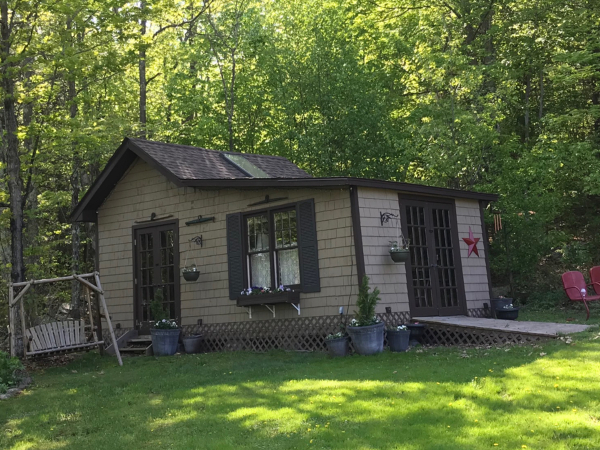 What a beauty your cottage is. I love the lattice and window boxes. Those red chairs are great. I am hoping to have one soon. Should I say, sooner rather than later. I have been wanting one for two years. It's so nice to have a dedicated place for all my garden stuff, Betsy! Although some of it does end up in the garage during gardening season....I'm too tired at the end of a busy day in the garden to always put things back where they belong, oh well! I love your little cottage! That hydrangea tree is gorgeous. I've never had any luck with hydrangeas, but after seeing this picture I'm tempted to try again! Oh, and I'm a sucker for window boxes. I've had some in a past house and loved decorating them as the season changed. I adore window boxes, Jeannette! They don't make sense really anywhere else on my property, but the one on the garden cottage is perfect! It's one of the first things I add flowers to each spring...I should really put in a trailer though...thanks for the reminder! Debbie, your garden cottage is darling! What a sweet hubby to add the lattice while you were at work. Cottage gardens are my favorite. That's what I strive for in mine. I love Peonies as well. Mine are just starting to open. My peach one opened last week and it is stunning! Only two blooms, but wow! One of my favorite cottage plants are Delphiniums. Have you planted any of them? My friend has a Pinky Winky tree and it is lovely. My Hydrangea tree is a Limelight. Love it too! Thanks for sharing with the Garden Party. Hi Jann - I looked at the Limelight also but wanted the pink tones of the Pinky Winky so that won out! I did put in some Delphiniums, not in that garden but elsewhere, and I actually added three this spring. Peonies are one of my favorites - I planted ten the first spring I was in the house - 7 are next to the garden cottage along the back of the wild garden and 5 have buds on them for the first time, yippeee!!!! Of the other three, two died...and one is struggling. Sad. I also put in some foxgloves this year in the wild garden, and some larkspur in another garden....also cottage favorites! And always cosmos, which I start from seed. The animals get some, but I put in plenty so hopefully soon I'll have riots of color and be in my glory! What an amazing job on the shed. Rome wasn't built in a day (I always remind myself!). The lattice works wonders, and it's so fun to move on to the flowers. Your Sweetie is a true sweetie!! Can't wait to see your hydrangea tree---never heard of it. Up here in Michigan we have tons of stones. We dig and then have to sift them out. Always a pain but the soil is excellent. Funny how we all have something different. Keep up the good work, Debbie! We have giant rocks and clay soil, which is so amazingly frustrating any time I dig even the smallest hole - it turns into a huge job! Raised beds are really the way to go around here, if one were planning a garden from scratch and had the resources. First, It looks beautiful. Second, I too want to grow hydrangeas. No luck here yet at the farm. Old school hydrangeas don't do well here, Valerie - but the newer hybrids do. I amended the soil with a bunch of compost from my compost bin, so that will help tremendously. I had luck with some of those endless summer hydranges in a past house, I may try them again here at some point. Your garden cottage is coming along so so nicely! I love seeing the transformation. You have a knack for making things so pretty and so welcoming! Inside and outside as well. Oh my gosh, love that picture of the LILAC..GOODNESS GRACIOUS that is such a pretty purple! I can almost smell it! I dont think we have lilacs here. It gets too hot for them I think. Love seeing all your gardens come back to life and see what you have growing, and blooming! We have lots in full bloom here, and baby "maters". No baby 'maters' here yet - the tomato plants are in the veggie garden but are only about an inch tall!! :) It will be quite a while before we see any baby 'maters' sadly! Thank you for your sweet comment, you are truly so kind!! I do like to make things nice to look at....it gives me great joy to look out my bedroom window at my pretty garden cottage now! The Garden Cottage Got A Big Facelift! Gardens That Inspire Me To Get Out There & Dig!